Exosomes are nanovesicles that are released from normal and tumor cells and are detectable in cell culture supernatant and human biological fluids. Although previous studies have explored exosomes released from cancer cells, little is understood regarding the functions of exosomes released by normal cells. Natural killer (NK) cells display rapid immunity to metastatic or hematological malignancies, and efforts have been undertaken to clinically exploit the antitumor properties of NK cells. However, the characteristics and functions of exosomes derived from NK cells remain unknown. In this study, researchers from Kyungpook National University explored NK cell-derived exosome-mediated antitumor effects against aggressive melanoma in vitro and in vivo. B16F10 cells were transfected with enhanced firefly luciferase (effluc) and thy1.1 genes, and thy1.1-positive cells were immunoselected using microbeads. The resulting B16F10/effluc cells were characterized using reverse transcriptase polymerase chain reaction (RT-PCR), western blotting, and luciferase activity assays. Exosomes derived from NK-92MI cells (NK-92 Exo) were isolated by ultracentrifugation and density gradient ultracentrifugation. NK-92 Exo were characterized by transmission electron microscopy and western blotting. Te researchers also performed an enzyme-linked immunosorbent assay to measure cytokines retained in NK-92 Exo cells. The in vitro cytotoxicity of NK-92 Exo against the cancer cells was determined using a bioluminescence imaging system (BLI) and CCK-8 assays. To investigate the possible side effects of NK-92 Exo on healthy cells, they also performed the BLI and CCK-8 assays using the human kidney Phoenix™-Ampho cell line. Flow cytometry and western blotting confirmed that NK-92 Exo induced apoptosis in the B16F10/effluc cells. In vivo, they used a B16F10/effluc cell xenograft model to detect the immunotherapeutic effect of NK-92 Exo. They injected NK-92 Exo into tumors, and tumor growth progression was monitored using the IVIS Lumina imaging system and ultrasound imaging. Tumor mass was monitored after in vivo experiments. RT-PCR and western blotting confirmed effluc gene expression and protein levels in B16F10/effluc cells. B16F10/effluc activity was found to increase with increasing cell numbers, using BLI assay. For NK-92 Exo characterization, western blotting was performed on both ultracentrifuged and density gradient-isolated exosomes. The results confirmed that NK cell-derived exosomes express two typical exosome proteins, namely CD63 and ALIX. The researchers demonstrated by western blot analysis that NK-92 Exo presented two functional NK proteins, namely perforin and FasL. Moreover, they confirmed the membrane expression of FasL. The enzyme-linked immunosorbent assay results indicated that NK-92 Exo can secrete tumor necrosis factor (TNF)-α, which affected the cell proliferation signaling pathway. The antitumor effect of NK-92 Exo against B16F10/effluc cells in vitro was confirmed by BLI (p < 0.001) and CCK-8 assays (p < 0.001). Furthermore, in normal healthy cells, even after 24 h of co-culture, NK-92 Exo did not exhibit significant side effects. In the in vivo experiments, tumors in the vehicle control group were significantly increased, compared with those in the NK-92 Exo-treated group (p < 0.05). 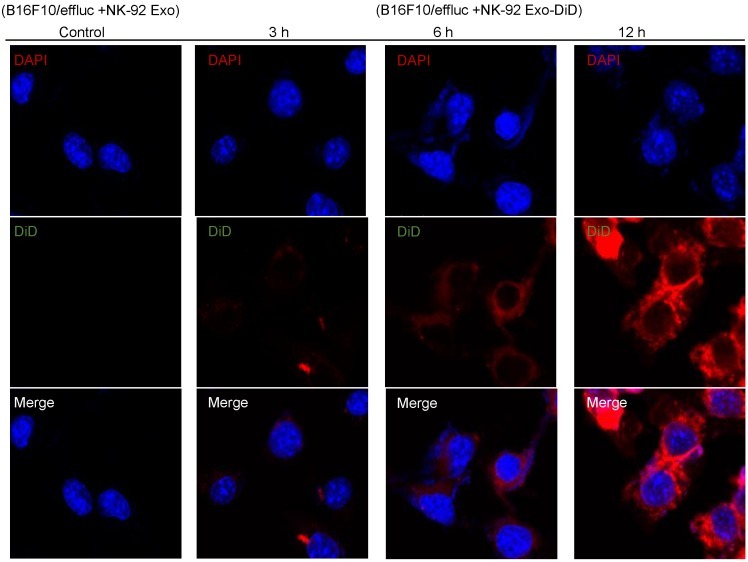 The B16F10/effluc cells were co-incubated with vehicle, NK-92 Exo, and fluorescent dye (DiD)-labeled NK-92 Exo (10 µg). Confocal microscopy images were obtained after 3, 6, and 12 h co-incubation.